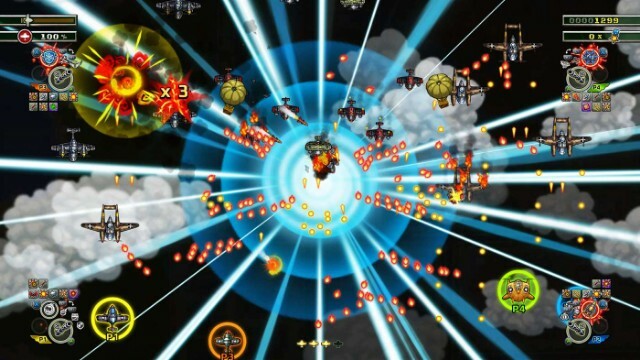 If you’re a fan of the classic, retro-infused vertically scrolling shoot ‘em up, then recent years have been kind to you. With the Sky Force series bringing two fantastic titles to multiple platforms and other classics and hidden gems appearing too – Shikhondo: Soul Eater and Xenoraid spring to mind – there’s certainly been no shortage of quality shmups on Xbox One. 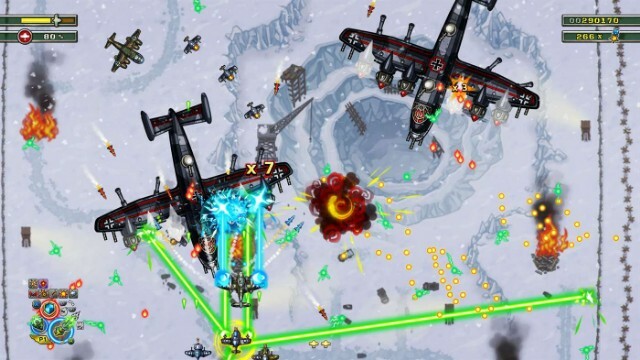 That doesn’t mean we aren’t willing to accept another lovingly crafted and well worked title into the fold though, but does Aces of the Luftwaffe – Squadron have what it takes to keep up with the other brilliant titles available? I suited, booted and took to the skies to find out. Before we get started, let’s not forget that Aces of the Luftwaffe – Squadron isn’t an entirely new game. Whilst the Squadron addition in the title ensures that this is a new release on Xbox One, Aces of the Luftwaffe did originally make an appearance back in 2013. Back then though, the game was a purely solo side scrolling experience, and this time things have changed dramatically. Instead the gameplay is now found to be taking a vertical route and the possibility of playing with up to four players is a reality. Are these changes enough to bring a more memorable experience? – I’d say so say, yeah! 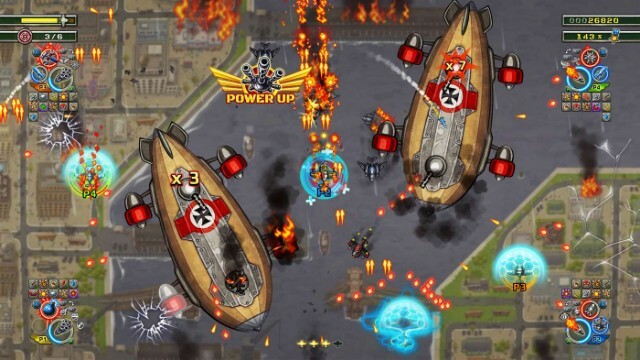 Aces of the Luftwaffe – Squadron brings players into the realms of an alternative reality. Remember Wolfenstein and how the Nazis actually won? Well that’s what’s going on here too, although it’s not quite that far ahead and the Nazis haven’t actually won just yet. You won’t find rampant run and gun gameplay here though, instead you’ll be taking the battle to the skies to take on a secret German commando unit that has risen out of nowhere to become a threat to the safety and security of the world. You are the one who must take them down. To do this you’ll need to take your squadron of pilots through 25 stages of enemy planes, ships and all sorts of menacing machines mustered up by the Germans, beating them in the process. It’s not revolutionary, it’s not original, but it’s fairly fun and you’ll enjoy doing so, especially if you can persuade three others to jump in for the local co-op. If you can’t muster any friends to join you in the fight though then it’s not an issue as all four ships can be controlled by a single player. Whilst it can be challenging trying to evade the bullet-hell enemy fire that litters the screen with four separate planes, having one take a little too much damage won’t matter all too much as they will come back into the fight shortly after. Even with 25 different stages to complete, it doesn’t take long before things start to feel a bit ‘same-y’. This is thanks to the fact that none of the levels are overly long or that difficult, not to mention that many look very similar. That’s not a completely bad thing as it is rather enjoyable dodging between bullets and picking when to shoot, when not to, and trying to put a tactical side to position your squadron, ensuring maximum hits on the enemies, but it would have been nice to have seen something a little more vibrant and memorable from each of the levels. Even with each level boasting an additional optional objective to gun for, there is still plenty of room for more excitement to be added. Sadly, that’s all there is though in terms of objectives. Fortunately, things aren’t all shallow and basic and thanks to the chit chat between squad members, there is a sense of personality that helps move the game along. Additionally, something else that makes your squad more than just a few faces and planes is the skill tree, and as you complete levels, earn medals and level up, you’ll unlock points which can be spread across four different skill trees; one for each of the pilots. Most of the skills you’ll unlock will mainly focus around bonuses to health and damage output, however dig a little deeper and you will find some that unlock special abilities that can benefit the whole team. If you use these strategically they can give a helping hand when it comes to nabbing additional objectives within a level. While none of the levels aren’t ever outstanding, Aces of the Luftwaffe – Squadron is still enjoyable. even if only for the first time you play. But that said, there are a few things to note that if changed would make the game a little better. The standout one here is to up the pace of the game to make combat more challenging, whilst another would be to create a longer screen rather than wide one we have; there is currently more that can be seen horizontally than vertically. Before things start to feel negative though, there is another gleaming positive I wish to talk about and that is in regards the boss fights. You see, I love a good boss fight, especially those that feel quirky and in Aces of the Luftwaffe – Squadron, they definitely feel quirky. The reason for this is thanks to how each boss presents themselves. In typical boss fashion, each one is memorable and comes with not just a larger than life personality, but an even larger machine to match it in; be it a UFO-style plane, a floating train type machine or anything else along the way. For me the boss fights are quite possibly my favourite part of the game, adding a little extra challenge, to feel like something you’d find in a typical platform type game. They certainly leave an impression but unfortunately they are still fairly easy to get through. Once you’ve figured out their patterns, you’re not really going to struggle with things. All said and done that is Aces of the Luftwaffe – Squadron wrapped up. It’s not a game that is going to be talked about as a Game of the Year contender, but it does have enough in it to provide a few hours of fun for those that fancy a new scrolling shoot ’em up. Yes it would have been nice to have had a little more challenge and variation in the gameplay, but it is a more than capable addition to the genre.